have experience setting up software programs. WITHOUT YOUR WINDOWS OPERATING SYSTEM CD/DISKS. 2.) Double click on Make New Connection (see example below). then click Next (see example below). 5.) 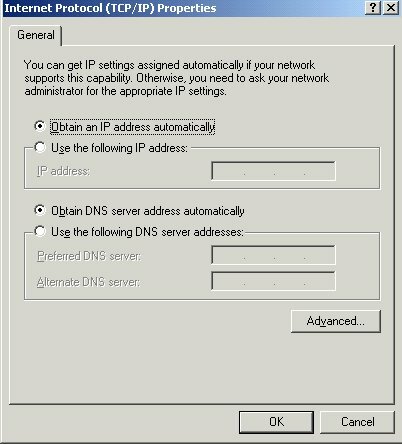 In the Welcome to the Internet Connection Wizard window, select I want to set up my Internet connection manually, then click Next (see example below). 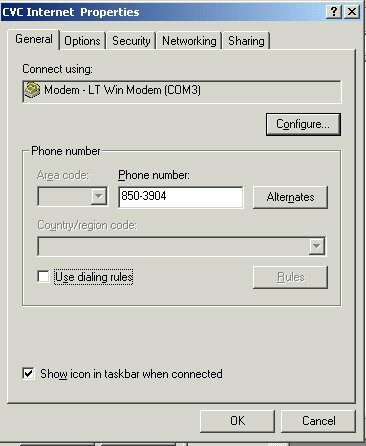 a phone line and a modem, then click Next (see example below). Towards the bottom of the window, click on the Advanced button (see example below). At the bottom of the window, click OK.
enter CVC Internet, then click Next (see example below). on your e-mail's, then click Next (see example below). (example: username@cvc.net), then click Next (see example below). Outgoing mail server, then click Next (see example below). select this option), then click on Next (see example below). 17.) Setup for the Dial-up Networking is now complete. Click Finish. 18.) 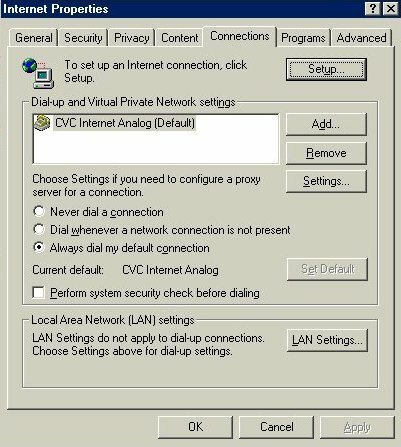 In the Network and Dial-Up Connection window, single right click on your CVC Internet icon and select Properties. 19.) 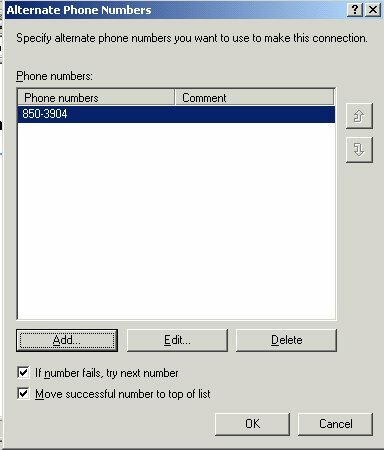 In the Properties window, verify the Phone Number as being 850-3904. Click on the Configure button under the Connect using field. 20.) 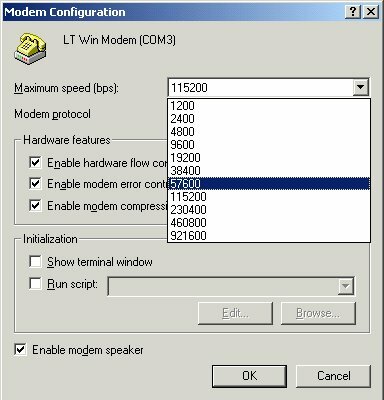 In the Modem Configurations screen, lower the modem speed from 115200 to 57600. Click OK to return to the Properties screen. Be sure the Initialization options are not marked. Click on the Add button to continue. 22.) 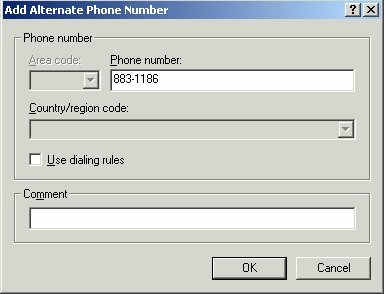 In the Add Alternate Phone Number screen, enter the dial up number as 883-1186. Click OK to return to the Alternate Phone Number screen. Click OK to return to the Properties window. Click on the Networking tab to continue. 24.) 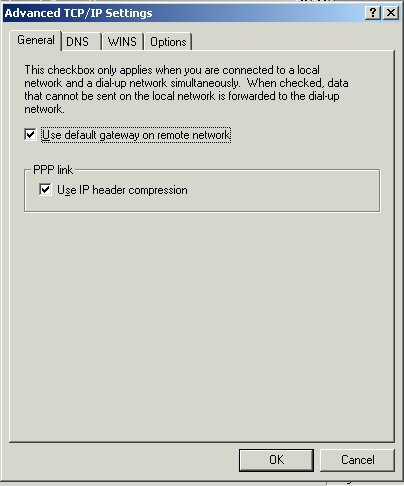 In the Networking screen, under "Components checked are used by this connection" there should be a check mark by "Internet Protocol (TCP/IP)" and "Client for Microsoft Networks". 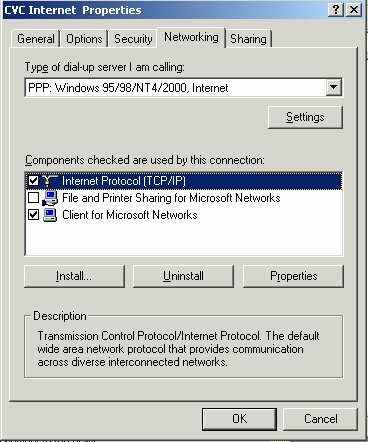 Click once on "Internet Protocol (TCP/IP)" to make it highlighted and click on Properties under the window. Click on the Advanced tab at the bottom of the screen to continue. 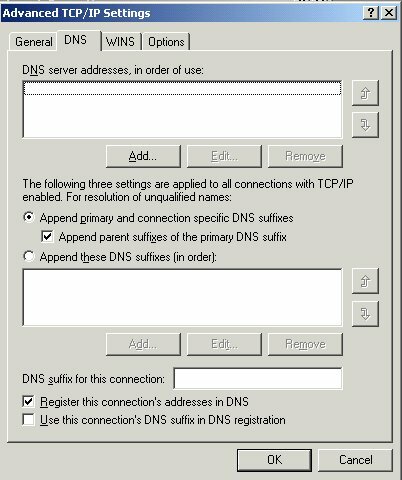 Click on DNS to continue. Click on WINS to continue. 28.) 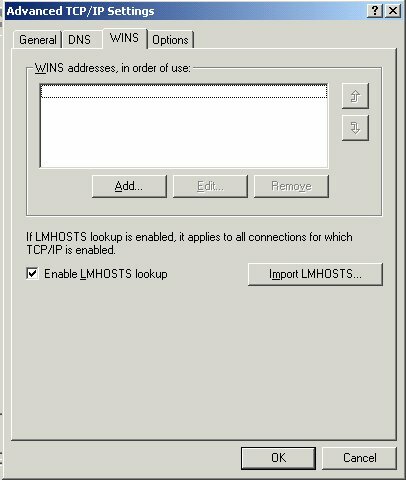 In the WINS screen mark the option "Enable LMHOSTS lookup". Click OK to return to the "Internet Protocol" screen. Click OK to return to the "Networking" screen. 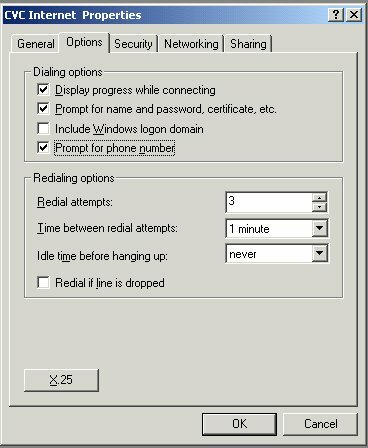 Click OK to return to the "Network and Dial-up Connections" window. Close remaining windows to return to the desktop. 1.) On the desktop (computer's main screen), double-click on the My Computer icon. 2.) In the My Computer window, double click on the Control Panel icon. 3.) In the Control Panel window, double click the Internet icon. 4.) In the Internet Properties screen, select the General tab. On the General tab screen, Home Page section, Address box: enter http://www.cvc.net. At the bottom of the Internet Properties window, click on the Apply button. 5.) At the top of the Internet Properties window, click on the Privacy tab. In the Privacy screen, click on the Advanced button. 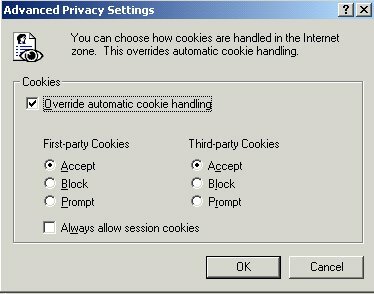 "Accept - Third Party Cookies"
Click OK at the bottom of the Advanced screen. Click Apply at the bottom of the Privacy screen. 7.) Go to the top of the Internet Properties window, and click on the Connection tab. 8.) In the Connection screen, click on the bullet beside Always dial my default connection. To continue setup, click on the Settings button. 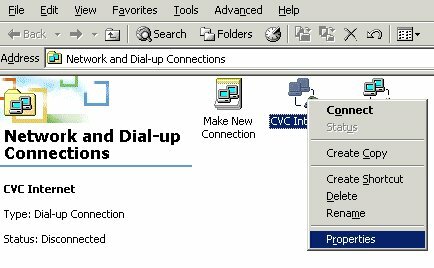 In the Dial Up Settings box, User name box: enter your CVC Internet username (in lowercase, Do Not add @cvc.net). In the Password box: enter your CVC Internet password (in lowercase). In the Domain box: leave this box empty. At the bottom of the Settings screen, click on the OK button. At the bottom of the Internet Properties window, click on the Apply button, then OK.
Back in the Control Panel, close the window with the "X" in the top right corner. To verify that your e-mail settings are properly set, please complete the following steps. 1. Open Outlook Express (you do not need to connect to the Internet - click "Work Offline" if your Connect To window appears). At the top of the Outlook Express window, click on the "Tools" menu and select "Accounts". 2. At the top of the Internet Accounts screen, click on the "Mail" tab. Click once on the mail account so it becomes highlighted, then click on the "Properties" button (right side of the screen, third button down). Mail Account - Should contain the mail server addressing for your e-mail account (example shown below). Name - Should contain your real name or business name. Organization - Optional Setting, this field can contain your organization's name. E-mail Address - Make sure the correct e-mail address is showing (example shown below). Reply Address - Optional Setting, this field can contain your e-mail address, but make sure the address is correct. Include this account when receiving mail or synchronizing - This setting should be selected (check marked). My Incoming mail server is a: POP3 sever should be showing. 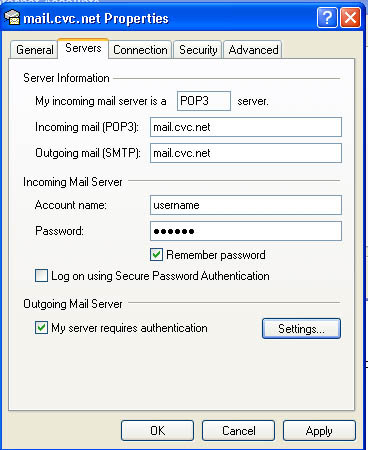 Incoming Mail (POP3): This setting should contain the mail server addressing assigned to your e-mail account (example shown below). 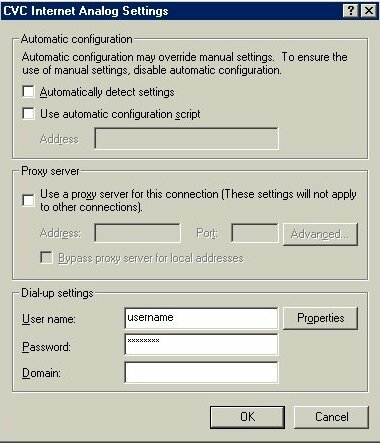 Outgoing Mail (POP3): This setting should contain the mail server addressing assigned to your e-mail account (example shown below). Incoming Mail Server, Account Name: This should contain your mailbox username. Incoming Mail Server, Password: This should contain your mailbox password. Log on using Secure Password Authentication: Should not be selected. Outgoing Mail Server, My Server Requires Authentication: This option should be selected. 5.) At the top of the Properties window, click on the "Connection" tab. In the Connection screen, make sure "Always connect to this account" using is selected and that "CVC Internet" is showing in the white field below. 6. At the top of the Properties window, click on the "Security" tab. In the Security screen, the only option that should be active, is the "Algorithm (3DES)". In the section "Sending", Do Not select the option "Break apart messages larger than". In the section "Delivery", Do Not select the option "Leave a copy of messages on server". 8. At the bottom of the Properties window, click on the "Apply" button, then click on the "OK" button. 9. In the "Internet Accounts" window, click on the "Close" button. 10. In the "Outlook Express" main window, click on the "File" menu (located at the top of the Outlook Express window) and select "Close". You're Finished! For more information on using e-mail or browsing the Internet, please refer to the "Help" menu located within the e-mail software program. To keep Internet Explorer running at it's best, make sure to periodically clean the cache. The cache stores graphics of sites you browse on the Internet, so the next time you revisit the site it will load the page much faster. But after extensive browsing the cache will become plugged, causing problems with browsing. 1.) 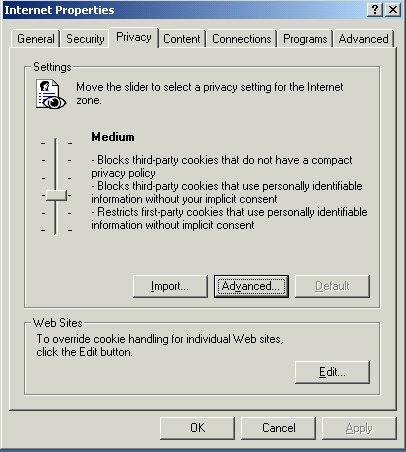 Click Tools in the top left corner of Internet Explorer, select Internet Options. 2.) Click on Delete Files, another window will appear stating "All Temporary Files Will Be Deleted", click OK to continue. 3.) When the hour glass disappears, click OK again to return to Internet Explorer. Copyright � 1996-2008, CVC Internet, LLC. All rights reserved.